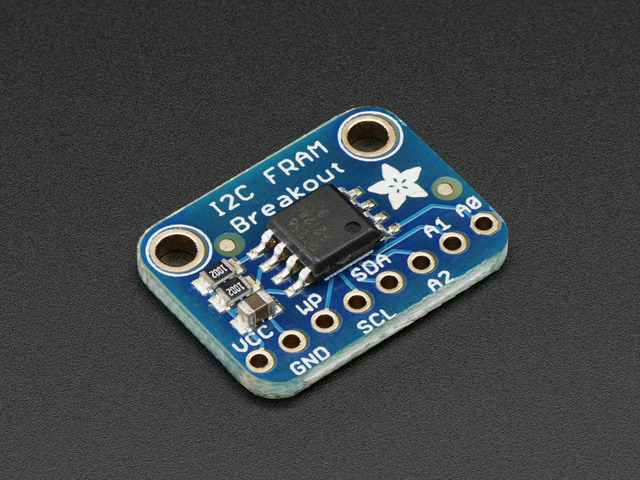 The I2C FRAM has a default I2C address of 0x50 but you can set the address to any of 8 values between 0x50 and 0x57 so you can have up to 8 of these chips all sharing the same SCL/SDA pins. We suggest just connecting up the power and SDA/SCL pins for now. Once you have things working, change up the address as desired. Place the Adafruit_FRAM_I2C library folder your arduinosketchfolder/libraries/ folder. Then when you begin(), pass in the i2c address. The default is 0x50 so if you don't put any value in the default is used. which returns a byte reading. This guide was first published on May 20, 2014. It was last updated on May 20, 2014. This page (Arduino Test) was last updated on Apr 17, 2019.